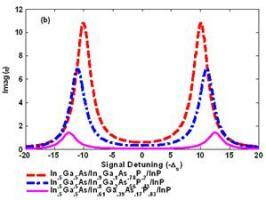 InGaAs/In1-xGaxAs1-yPy/InP QD system is used to study slow-light. This includes the study of structures with different WLs and QD sizes. This choice takes into account covering their emitted wavelengths (1.3-1.5µm). In addition to this, Effect of different parameters like: linewidth, de-phasing rate and pump-power is studied on the linear absorption, refractive index, and then on slow-light. The storage time of the proposed buffer is studied. While it is shown that these structures needs a low pump power to get the required slow down, it is found that reducing In content gives lower slow-down factor. A storage time adequate for all-optical communication devices is obtained.